The Infinite Monkey Cage, the legendary BBC Radio 4 programme, brings you this irreverent celebration of scientific marvels. Join us on a hectic leap through the grand and bizarre ideas conjured up by human imagination, from dark matter to consciousness via neutrinos and earthworms. 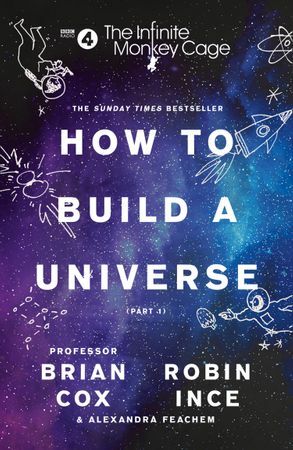 Professor Brian Cox and Robin Ince muse on multifaceted subjects involved in building a universe, with pearls of wisdom from leading scientists and comedians peppered throughout. Covering billions of concepts and conundrums, they tackle everything from the Big Bang to parallel universes, fierce creatures to extraterrestrial life, brain science to artificial intelligence. How to Build a Universe is an illuminating and inspirational celebration of science – sometimes silly, sometimes astounding and very occasionally facetious. Professor Brian Cox, OBE is a particle physicist, a Royal Society research fellow, and a professor at the University of Manchester as well as researcher on one of the most ambitious experiments on Earth, the ATLAS experiment on the Large Hadron Collider in Switzerland. He is best known to the public as a science broadcaster and presenter of the popular BBC Wonders trilogy, Human Universe, Forces of Nature and Stargazing Live.